The Tourism Promotions Board (TPB) is set to host the country’s biggest and significant travel trade event – the Philippine Travel Exchange (PHITEX), on August 28-30, 2018 at Marriot Grand Ballroom. This year’s PHITEX will once again promote the country as the premier tourist destination among some of the world’s biggest travel and tour buyers. With this year’s theme “Tourism is our Business: Guarding our Environment, Reliving our Culture”, TPB aims to provide a venue for foreign buyers of travel products to discuss business with Philippine tourism suppliers with a possibility of securing booking on-site or at least business leads. The event is also expected to entice buyers to include the Philippines in their tour programs or expand their existing tour programs of the archipelago and to generate maximum exposure of the Philippine destinations to key target markets and launch packages designed for niche markets. Kicking off this week-long event is the pre-tour on August 28 for registered buyers covering Bataan, Laguna, Batangas, Tagaytay and Corregidor that will highlight interesting Philippine culture and heritage. 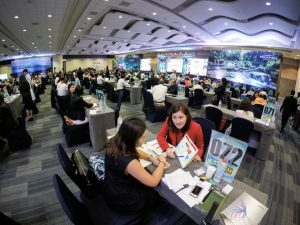 The main event of PHITEX 2018 is the Travel Exchange (TRAVEX), which includes exclusive business-to-business appointment meetings between Philippine sellers and foreign buyers. By giving them the chance to personally meet the local sellers, buyers are introduced to the Philippines’ marketing trends and practices. In exchange, sellers are given an edge to offer globally competitive tour packages to the international market. The event will also provide foreign buyers the opportunity to experience the fun and exciting post tours to main Philippine attractions and destinations. Now on its 17th year, PHITEX has been continuously sustaining the growth that the Philippines has gained in the global tourism market. For more information about PHITEX 2018, visit www.phitex.ph.